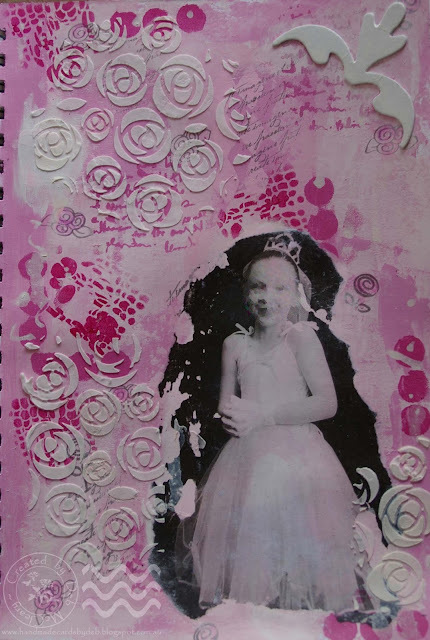 There is a lot of layering of acrylic paints with this spread, and stencilling of both paint and texture paste, as well as employing the 'transfer technique' to get my photo onto the layout. I've been learning a lot of these techniques from the awesome Wanderlust 2016 journey I'm on - it's fabulous!! I have also stamped some text and whimsical rose images with Archival Ink in 'Watering Can'. Thanks for visiting - I hope you like my Art Journal page! It has been way too long since we've seen your work Deb and I'm glad you're back! 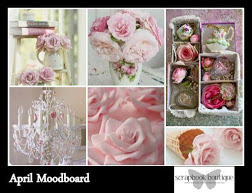 Wow can see you had a tonne of fun with this journal page and all the layers of roses and shades of pink are perfect for this month's mood board challenge. Must have been something in the air, I was mojoless for a while there myself lol. Your journal page is gorgeous Deb, those roses are perfect! I'm so happy you could share this with us at Scrapbook Boutique! Welcome back Deb! Glad to see your mojo has returned. This art journal is just awesome. Loved reading your explanation of how you completed this! Such a wonderful take on this months moodboard. Thanks for joining us at Scrapbook Boutique. You've added lovely colour and texture here and recorded a lovely moment in time.